Koh Samui’s biggest monthly party is back at the Lake View venue this coming Thursday with special guest Timo Garcia. 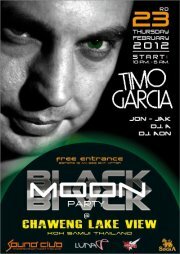 Fresh off the back of his DJ Mag Asia tour Timo will be making his Koh Samui debut for the Black Moon Party. Currently releasing some of the coolest music around for some of the worlds best record labels with collaborations with the likes of X Press 2.